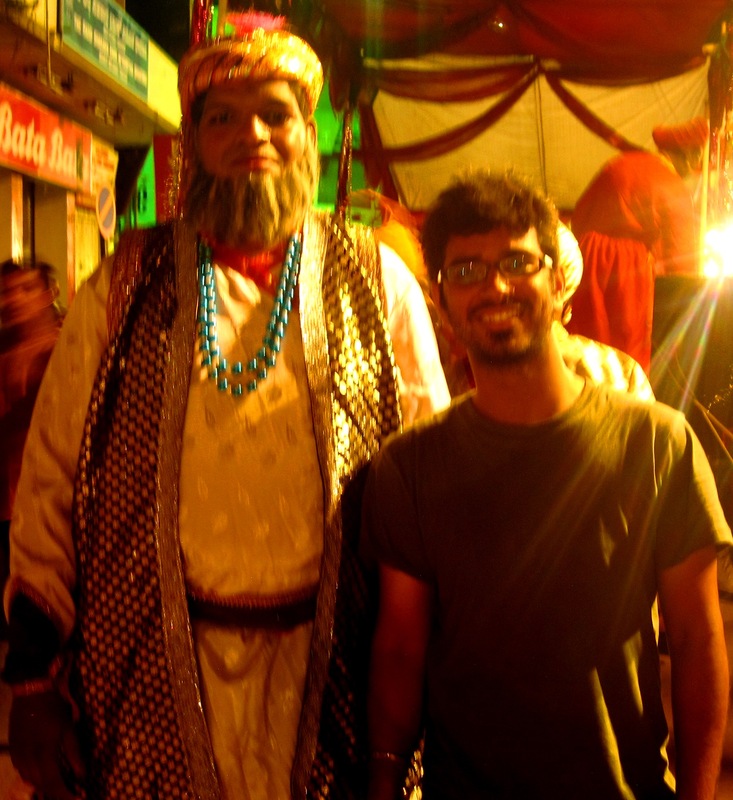 Celebrating festivals – Karwar Utsav & Shivaji Jayanti! 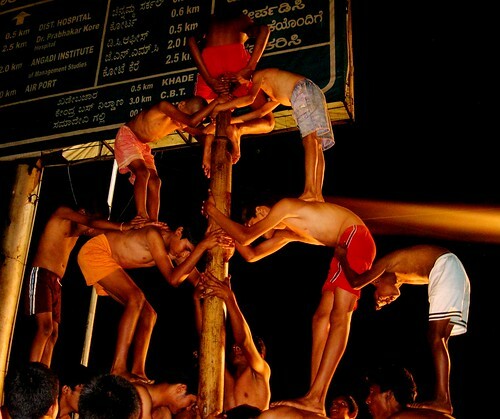 In a small coastal town called Karwar, all its residents show up to celebrate this festival with full pride and enthusiasm, the likes of which might not even be present in a normal joint family today! 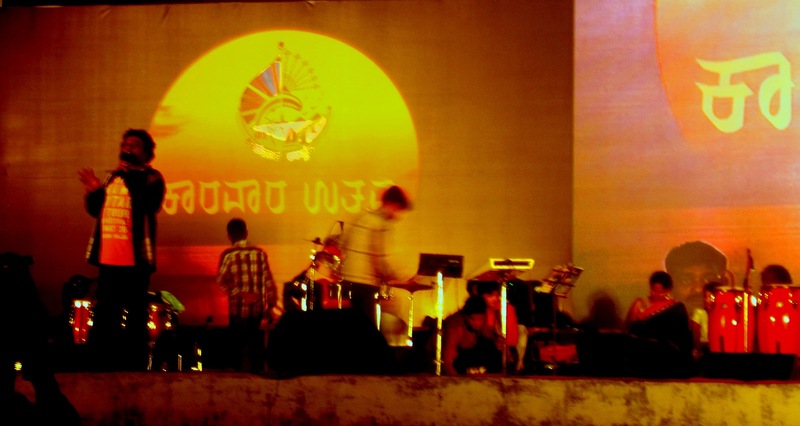 Karwar Utsav is usually a 3-4 day affair and brings forth the cultural image of the town in the forms of dance, music, drama, and all art forms. 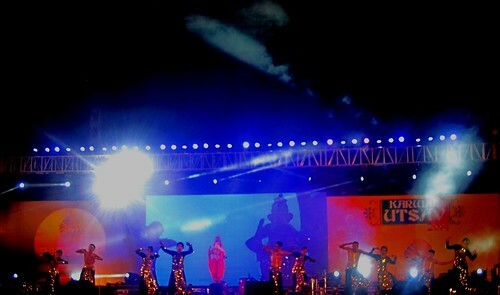 There is a large stage setup with all the latest stage controls right by the Tagore Beach. I was there on the opening day and enjoyed so much the dance performances (competition) which were spread over regional/western, junior/senior and singles/group categories!! Everyday, kids start gathering at 6pm, and then the daddies join directly from office while mommies cook the food (I got 1 invitation too for that!) and come and the entire family leaves only after conclusion at around 1am! To add more sparks to this fair, a food festival, circus including the bikers’ cage (remember? ), the giant Ferris wheel and other joy rides are also arranged. Crowded till wherever your gaze lands! Super Star Sadhu Kokila in action! 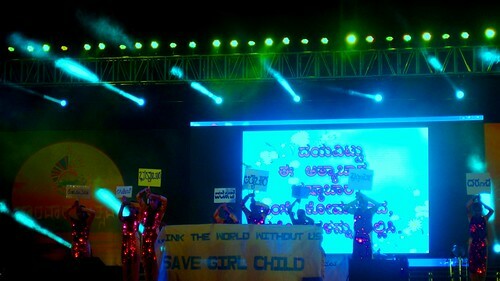 Famous celebrities also come and perform for the audience. I enjoyed the performance of a very famous celeb of Kannada industry- Sadhu Kokila. And had I stayed any further, next day’s performance was Anuradha Paudwal’s! 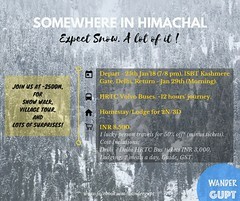 All the hotels and lodges are booked out at this time as people from neighboring villages also come to audience the festive mood. Shiva Jayanti festival is celebrated here to remember the great warrior king Chhatrapati Shivaji who laid the foundation for the Maratha clan, much known for its valor on the battlefield. 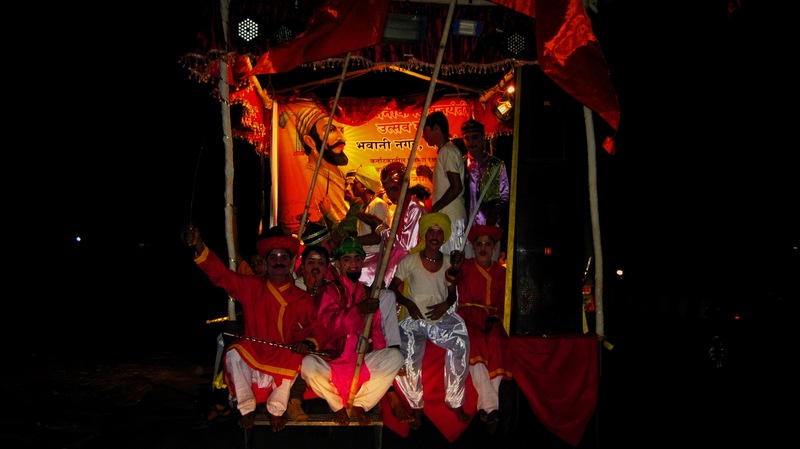 The processions are carried out in the form of ‘Chitra Rath’, chariots depicting lessons and scenes from Shivaji’ life. A ‘Chitra rath’ being taken to the parade venue. One of the best parts I liked about this celebration was that every galli and mohalla (colony) participates and prepares its own ‘Chitra Rath’ and all these carts then make rounds (much like the Republic Day parade, but going round and round) where all the crowd gathers by the side to enjoy the sight. It is such an energetic crowd singing songs and slogans in the name of Shivaji. The processions start at around 10pm and believe me or not go on till 6am the next morning. I can vouch for that as I heard the slogan shouting and music playing when I woke up to leave for the next destination. Heart warming intensity, that! 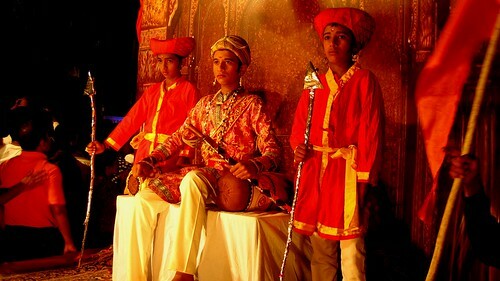 Belgaum is in Karnataka while Shivaji Jayanti is a Maratha festival celebrated in Maharashtra. Did you know that Belgaum has been on the border dispute between Karnataka and Maharashtra and the case lies in Supreme Court? Nevertheless, due to a large number of Marathi population in Belgaum, the festival is celebrated with all the more excitement and gusto. Incredible India and the surprises it holds on every other turn! Camping solo on a Beach – Little did I know! These surprise festivals are a treat, huh! ?